Despite a clear position taken by the Department of Transport that cyclists must dismount and become pedestrians before using any zebra crossings, Limerick City and County Council has described the zebra crossings on a cycle route as “a shared surface for both pedestrians and cyclists” with no need for dismount signs. On March 22 we published our original story on this issue — Zebra crossings increasingly used on cycle routes, but without warning cyclists must dismount — and last week we followed this up with the news of a plan to make the Walkinstown Roundabout cycling friendly which depends on zebra crossings where cyclists dismount by law. In Limerick City, zebra crossings form part of the city’s Smarter Travel Route 3 at the Groody Roundabout on the R445, near the University of Limerick. The project was funded by the EU. The roundabout (pictured above via Google Street View) is a large roundabout with three entry lanes at two of its four arms. “There are four zebra crossings on the roundabout that allow for safe passage for both pedestrians and cyclists through the roundabout,” said Laura Ryan, communications officer at Limerick City and County Council. Seven days ago we contacted the council again outlining the NTA’s position — the council have yet to respond. There is no disagreement between the National Transport Authority and the Department of Transport, Tourism and Sport on the issue. The Department is aware of the designs included in the Cycle Manual published by the National Transport Authority. With regard to the design included for zebra crossings at roundabouts nothing in the legislation has changed and cyclists are required to dismount before crossing at a zebra crossing. Separately a number of changes to our legislation with regard to cycling are being considered as part of the mid-term review of the National Cycle Policy Framework. These changes are being discussed internally by the Sustainable Transport Division and the Road Safety Division (who have primary responsibility for implementing change to the legislation) and with the National Transport Authority. (ii) The legislation does not preclude cyclists from using the crossing in conjunction with pedestrians. However, as the Department points out, as it stands, a cyclist needs to dismount in order to effect a formal request for traffic to stop, as this request is currently restricted to pedestrians. As DTTAS has stated, the NTA has been in prior communication with the Department regarding various changes to legislation to facilitate improved provision for the cycling mode, and indeed, the review of the National Cycle Policy Framework itself. This debacle illustrates the folly of cutting corners when copying Dutch designs. 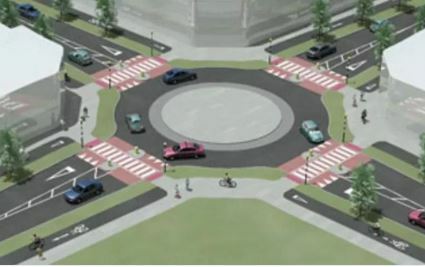 We just need to get on with amending the relevant laws and guidelines to harmonise them as far as possible with the Dutch equivalents (zebras, roundabouts, “sharks teeth”) so that proper designs can be built here. Very poor design here anyway: zebra crossings are only suitable on low speed routes with short crossing distances (ref. Traffic Management Guidelines 2003) and certainly not on the arms of large high-capacity roundabouts. Surprised that a Stage 1 Road Safety Audit did not kill off this design proposal at prelim design stage. A rather English design isn’t it DfT IE? In Ireland much of our roads guidance is a straight copy of UK guidance. Also many of the civil engineering consultancies that bid for such schemes are local branches or partners of large UK consultancies. It would be a mistake to view the Irish Roads Engineering profession as some self contained entity with its own identity. They are simply an offshoot of their UK equivalent. This is one aspect of Irish life where quite literally the British never left Ireland following independence.